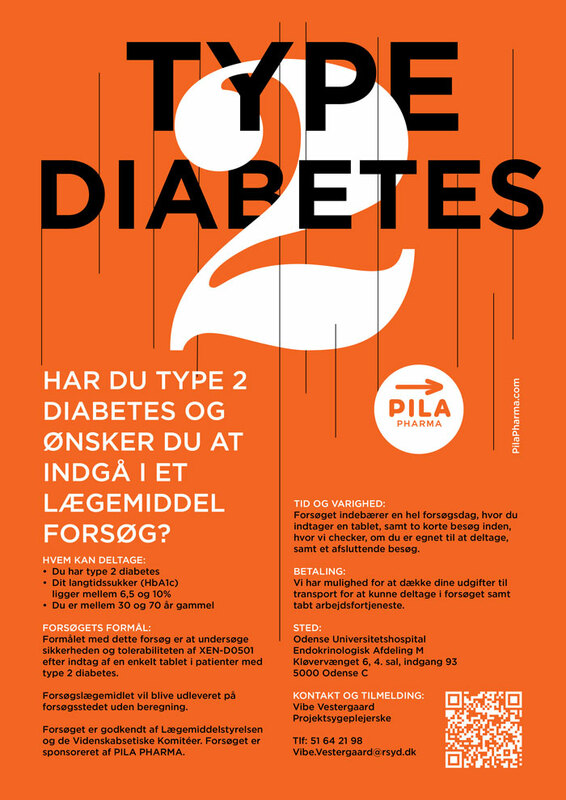 PILA PHARMAs aim is to develop a novel, first-in-class oral anti-diabetic agent that can be an effective and affordable alternative to current treatments. The target product profile is to effectively reduce blood glucose to near-normal levels via a dual regulation of insulin secretion and insulin sensitivity as well as regulating blood lipids and bodyweight thereby possibly reducing the overall risk of cardio-vascular disease. PILA PHARMAs, TRPV1 antagonist, XEN-D0501, is currently being investigated in type-2 diabetic patients for its safety following a single oral dose (trial PP-CT01, dosing completed) and for its safety and efficacy following 28 days oral dosing (trial PP-CT02, approved/ to be initiated) to demonstrate clinical proof-of-concept. HAR DU TYPE 2 DIABETES OG ØNSKER DU AT INDGÅ I ET LÆGEMIDDEL FORSØG?